The views and opinions expressed here are those of the authors and do not necessarily represent those of the Institute of Child Health or its funders. Written by Afroditi Avgerinou, 3rd year PhD student in the Francis Crick Institute/Institute of Child Health. In September 2018, for the 3rd year in a row, the UK Cystic Fibrosis (CF) Trust organised the “CF’s got talent!” competition. This involved 5 young CF researchers presenting their work in layman’s terms to improve engagement with patients. I have been working on my PhD project, which is funded by the CF Trust, for 2 years and I was one of the five researchers that presented in the 2018 competition. When I found out I had been selected to present in front of a few hundred people in a lecture theatre, and possibly thousands more online, I was terrified! At the same time, I felt honoured and a deep sense of responsibility. I did not want to let down people affected by CF, as they are putting their hope in researchers such as myself to deliver a cure. I also did not want to disappoint my supervisors or family and friends, who have been supporting me throughout my PhD. For this reason, and because I had never delivered a public engagement talk before, I spent a whole month creating a presentation and perfecting my speech. Thankfully, the CF Trust arranged for me to share my ideas with a person with CF, who would tell me whether I had managed to get rid of the science jargon. During our two talks, she offered great help and feedback that allowed me to produce a presentation we were both satisfied with. On the day of the presentation, my nerves returned. Even though my voice was a bit shaky, I was able to carry on and not forget my words, thanks to the number of times I had practised my talk. During my presentation, I explained how in CF a mistake/mutation in the CFTR gene causes problems in the lung. For my project, I hope to show that the lung cells with the genetic mistake can become the solution and offer a cure for CF. To do this, I am using ex vivo gene therapy, which means gene therapy that happens outside the body. The first step of this approach is to take some of the diseased lung cells from the CF patient through nasal brushing. After this, the cells are kept in the lab and allowed to multiply. Next, a correction mechanism, called CRISPR/Cas9, is inserted into the cells, to correct the mistake in the CFTR gene. 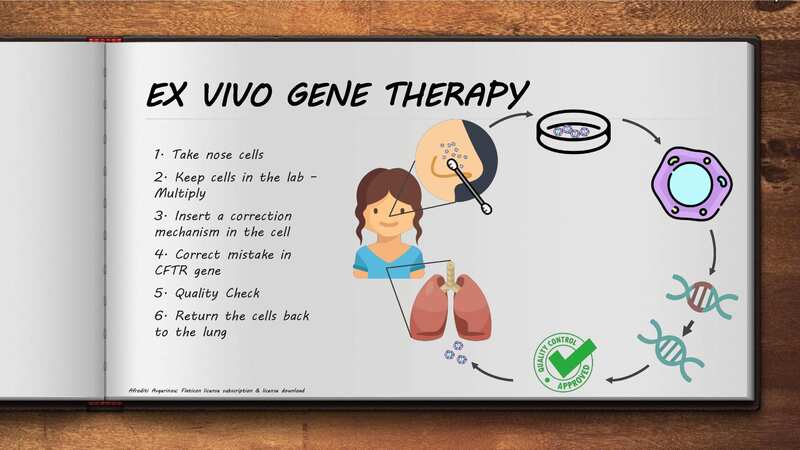 The corrected cells undergo quality control to check if they are safe and finally returned to the patient’s own lung where they will function as healthy cells and treat CF. I felt I was successful in explaining my project to everyone in the lecture theatre. Later, I found out that many people had left very positive and kind comments on the Facebook live stream of my presentation. People watching from home also had the opportunity to vote for their favourite presentation. To my surprise, when the time came to announce the winner, my name was called. I was excited and very pleased with the result! The prize was an all-expenses paid trip to the North American Cystic Fibrosis Conference (NACFC) 2019 in Nashville. There, I will communicate the results of my work to a wide audience. Winning the competition gave recognition to my work and all my team’s efforts. I am thankful to the CF community for voting for me, but irrespective of the win, the whole experience was very rewarding. Working in the lab, it is easy to get lost in the experiments and science, forgetting the reason why you are doing them. Being able to connect with the people that benefit from your research is inspiring and helps you refocus when things get difficult. In return, by communicating your research to patients, you are giving them hope and a promise: that you will do your best to help them and their families live a life unlimited by CF.